Cárdenas has arrived. 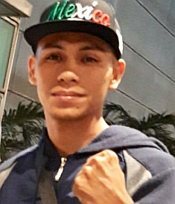 Hard-hitting Mexican warrior Marcos Cárdenas (19-6-1, 15 KO's) arrived at Ninoy Aquino International Airport on Monday (Feb 12) ahead of his important make-or-break battle against unbeaten Filipino Dave Peñalosa (14-0, 10 KO's) for the vacant WBO Oriental Featherweight Title this Saturday (Feb 16) at SM City North EDSA Skydome in Quezon City, Metro Manila, live in ESPN5. 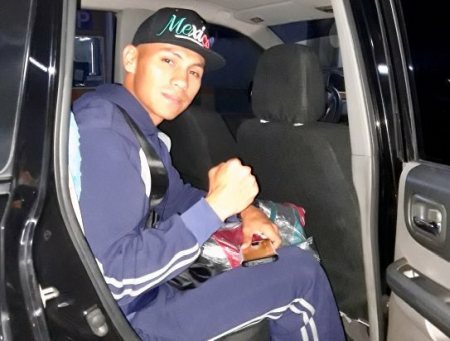 An orthodox boxer, Cárdenas, 28, landed in the blessed land of Jose Rizal together with his handler, 48-year-old veteran man of boxing Joel Gallegos, a Mexican-American of Houston, Texas. Appearing serious but friendly after the long trip from Sonora in Northwestern Mexico, Cárdenas was welcomed at NAIA by the punctual and cordial staff of GerryPens Promotions, and driven directly to his hotel in Quezon City for the visiting Mexican to have his well-deserved rest. "I am happy to be back in the Philippines," said Marcos Cárdenas, a man no stranger to fighting in the Philippines. Marcos Cardenas has arrived in Manila to do battle against Dave Peñalosa this Saturday. Indeed, looking back in time, the brave Mexican warrior waged a rough war here in Pilipinas against none other than world-ranked Genesis Servania. After ten rounds of action in Cebu, Servania decisioned Cardenas. But the Mexican displayed toughness, nerves of steel and a warrior's heart, characteristics of a real Mexican warrior. 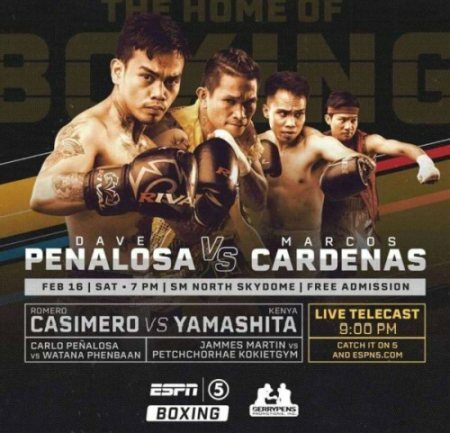 This coming Saturday, though, Cárdenas will climb the ring to square off "The Hunter" Dave Peñalosa, son of 2-division world champion Dodie Boy Peñalosa, a man willing to make a mark of his own in the sport of boxing. Boxing fans can't wait for the rumble to begin because the two men -- both 28 year old -- are entertaining action fighters willing to engage in center of the ring. So what will happen Saturday then? Will the taller, more experienced Marcos Cárdenas prove that he is in a fighting class above the Pinoy, dominating the young Peñalosa, hunting "The Hunter?" Or will the well-trained Dave Peñalosa deliver another spectacular and rewarding stoppage win to claim the Oriental Title as well as a berth in the WBO 126 lbs world-ranking? One thing is sure: Saturday's battle will test the determination, boxing skills and punching power of the two men, and may the best man win. The exciting boxing show will also feature former world-champion Johnriel Casimero (25-4, 16 KO's), promising flyweight Carlo Caesar Peñalosa (13-1, 6 KO's), as well as the young hard-hitting bantamweight "The Wonder Boy" Carl Jammes Martin (11-0, 10 KO's) of Ifugao. Peñalosa vs Cárdenas for the vacant WBO Oriental Featherweight Strap this coming Saturday (Feb 16) at SM City North EDSA Skydome in Quezon City, Metro Manila, is a production of promoter Gerry Peñalosa in association with ESPN5. The author Carlos Costa is a veteran Panama-born fight reporter living in Cebu, Philippines. Carlos can be reached by email: carlos512@hotmail.com and whatsapp/viber: 09184538152.